– the cake is awesome. Awesome indeed! It’s a bunch of diced apples surrounded by a few dollops of cake batter, that puffs and gently envelopes each piece of fruit, resulting in a dessert that’s a cross between cake and clafoutis. Very French, very elegant, just enough decadence to turn your afternoon tea into a four-star event. 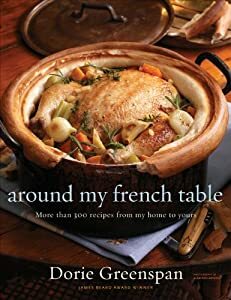 The recipe comes from a cookbook that’s been on my wish list at amazon.com since it’s released: Dorie Greenspan‘s Around my French Table. It’s just a matter of time until I move the book to my shopping cart, the reviews are stellar! Heat the oven to 350F. Butter a 8-inch springform type pan with butter and set aside. Peel and core the apples, cut them roughly in 1 inch chunks. Reserve. In a small bowl, mix the flour, baking powder, and salt. In a large bowl, beat the eggs with a whisker until frothy, add the sugar and whisk until smooth. Add the rum, vanilla extract, and mix well. Add half of the flour mixture, mix until fully incorporated, pour half of the butter and whisk to combine. Add the rest of the flour, then the rest of the butter. Pour the thick batter over the apples, and use a silicone or plastic spatula to mix them gently, trying to cover each piece with some of the batter. The mixture will seem too thick, and you will be tempted to use less apples. Do not. Trust Dorie. Pour the mixture in the prepared pan, use a fork to level the apples as much as possible, but don’t worry too much about it. Bake for 50 to 60 minutes, until golden and a cake tester comes out clean when inserted at the center of the cake. Remove the pan to a rack and let it cool for 5 minutes before opening the sides. Comments: The first time I baked this cake, I didn’t use all the apples because it seemed impossible to coat them all with the batter. I realized my mistake when I witnessed how much the batter puffed up during baking. On my second attempt, I used all the apples, and substituted apple schnapps for rum. We both liked the schnapps version better. A friend of mine used Calvados and also preferred it to rum. Either of those liquors reinforce the apple flavor. Next time I might add a little cinnamon to the batter, but this cake is pretty close to perfection as it is. 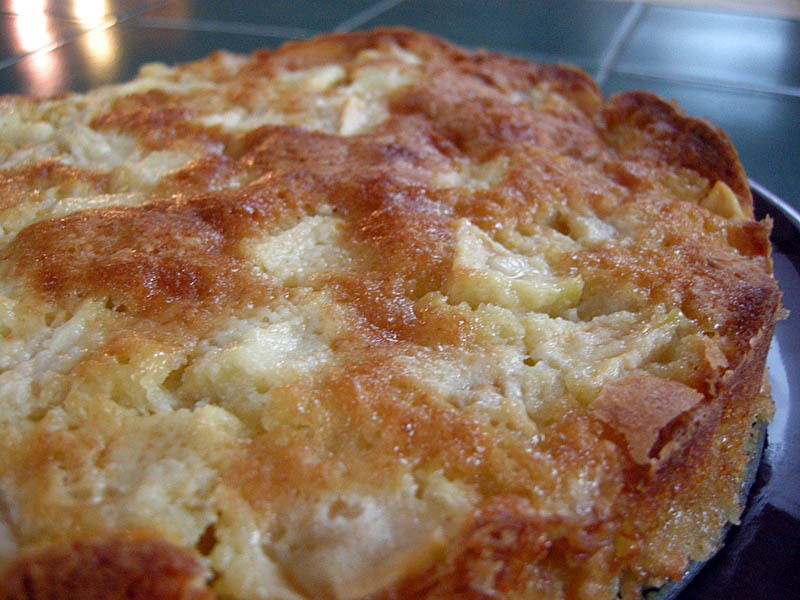 Apples are so good right now… couldn’t be a better time for this cake. I love apple cake, and your description makes me want to bake it right now! Nice job, Sally! Your cake looks great. I made this again for Thanksgiving. It was a nice change from the typical apple pie. Is it really 3/4 cup of baking powder?? Surely that cannot be right – 3/4 CUP baking powder? It would explode in the oven with all that in it. Sally, what a great looking cake and thanks for the review. I also have the book on a wish list and I really don’t like baking so it is good to see you making the effort, I’m inspired, just for this cake. Oh great, this after I went and bought a $6 vanilla bean to use in another apple dessert for our Grey Cup Sunday. When is it really worth using the bean instead of good quality extract? Bet this is an awesome breakfast dish! I think we can assume it’s 3/4 tsp baking powder. Odd measurement that is, but my set has one, yeah. Please see the questions above concerning the amount of baking powder. Once that’s corrected, this is a must bake cake…absolutely beautiful!! The best looking apple cake ever and most most delicious I am sure! Tittle well deserving. Ultimate recipe to treasure indeed! Thanks for sharing! Cheers!!! A fantastic cake for sure!!! Just updated the post with the correct printable recipe…. sorry about the boo-boos, life is beyond frantic these days! Would love to try it, but can you confirm how much 1 stick of butter is? This cake is excellent! I’ve made it 4 times in the past 6 weeks since I have a lot of apples from my friend’s tree. My husband just loves it. Thank you for another great recipe. I don’t know what went wrong. I have Celiac so switched the flour to gluten free but that usually isn’t an issue. My cake tasted like rum and nothing else. Could it be because I only had spiced rum in the house? Did anyone else use dark rum? Ann, sorry it did not work well for you! I cannot quite understand the overpowering of the rum, although I used a different alcohol, should not make that much difference, I don’t think. the other thing I thought is that this cake has such a high ratio of apples to batter, that it’s important that the batter “puffs up” exactly as it should, otherwise it won’t be the same. Maybe in this type of cake some adjustments must be made when using a flour different from all purpose? Since I got your message last night, I searched around the net but could not find anyone reporting a similar problem, or using non-gluten flour, so I cannot be of much help… sorry! thanks for reporting back, though! HI Sally, hey that looks great, I am working my way through all sorts of different apple cake recipes at the moment and now there is yet another one. Still hoping that US baking writers will just put either ounces or grams in their recipes for us Europeans. I asked Dorrie Greenspan once if she would but she said no. One of the frustrations in buying cookbooks on Amazon uk is that the publishers never say in their blurbs, ingredients in cups only, and it’s only when you get the book that you realize. Joanna, if you are searching for apple recipes, let me offer you one more, from a great blog I subscribe to. It is very unusual, but her description just made me want to have a slice right now! Anita, you should use vanilla bean paste/puree. It is far less expensive than a vanilla bean and just as good. I have ordered it from Cooks Vanilla, but they have gone up in price, and it is real expensive now whereas it wasn’t before. I buy the vanilla bean paste/puree from The Fresh Market here in Chattanooga, Tennessee. About $7.00 or $8.00 a bottle which lasts a long, long time! And, no shipping. Cooks charged me nearly $8.00 shipping!! So I know this is an older post but it popped up and since I just blogged about apples – thought I’d take a look. Love the rum addition and think that a bit of honey would work well too. I might just need to give this a try. Have a great weekend Sally! I’ve been making this since it was first posted and it is a hit in my family. I think I’ve made this recipe more than 50 times…..it is a winner! THanks so much for your comment, Darlene! Great to know you have that recipe as a “regular” in your home! grazzie mille! Regards from USA for you too…. love love love Italy! Sally, I am sure this is a very delicious cake and I am interested in trying it, however, I do not have rum or any apple flavored liquor in my house and I will not go out and buy some just for this cake as I do not like the taste of liquors in food. I do not drink alcohol or use alcohol at all. Do you have any suggestions or do you think it will taste okay without using that? I would simply omit it, the cake will be amazing as it is, I am sure, it’s a lot more about the apples and the amazing texture of the cake around it. I hope you will give it a try! I bet apple cider would be a good substitute for the alcohol. Mary, I think you can get by with any round pan. The spring pan is nice for the presentation, once you open the sides it looks very nice… but, come to think of it, this is such a traditional recipe, probably around for generations in France. They did not have spring pans, and I am sure that did not stop them from enjoying this! 😉 I would probably add a parchment paper in the bottom of the pan, and then simply cut slices as you would in a normal cake pan…. Hope you try it! Will have to try it with the mixture of sugar and cinnamon sprinkled over the cake. 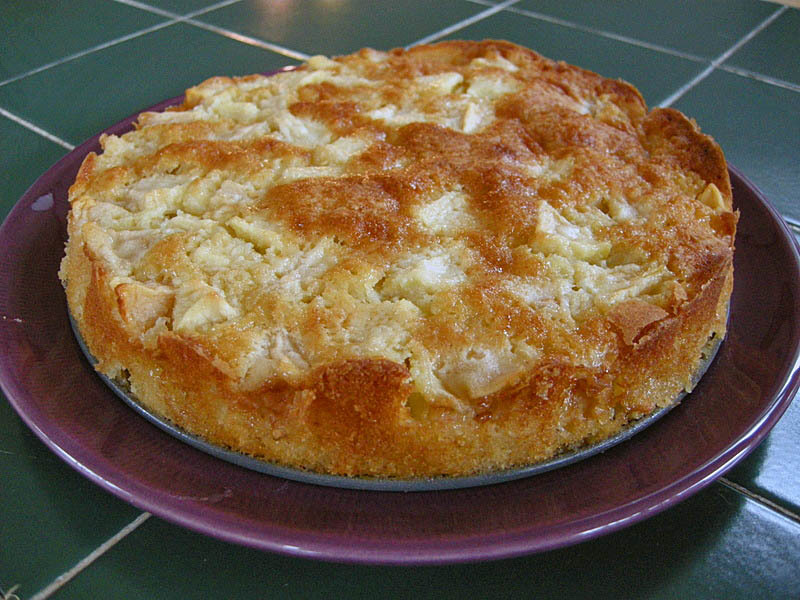 This is the best Apple Cake. My hubby keeps asking me to make it. It is a wonderful cake indeed! I should make it again to bring to our department, as since we moved to Kansas I haven’t made it. Darlene (or anyone), I have Bacardi Rum in my house so will that work? Yes I agree, I have been using Cuban rum and now have Jamaican rum. I don’t see a problem using Bacardi Rum…I have some too and will try it next time. I think I’ve made this cake over 50 times for sure. It’s the best! I just bought a large bag of cherries–do you think they would work with this recipe or should I just search for a clafloutis one? I asked about the bacardi rum earlier and you said you can just omit it but won’t this much liquid change the cake and could you use apple juice in place of the rum? Do you think rum extract would work? Or should I just use apple juice? I would not use rum extract….it would be too strong of a taste. The cake really doesn’t have a taste of rum. If omitting rum I would use apple juice as suggested by Sally or nothing at all. I think I have to make another one this weekend….I have been hinted to….. I just made the cake, and have some comments. First, I might have used larger apples, but I think less apples would have been fine. Next, loved the idea that it wasn’t that sweet, but think it might have benefited from a big dollop of ice cream or whipped cream…just me. In fact, I like plain cream on my cobblers, and this tasted like an apple cobbler to me. Very good, will definitely make it again. I’m thinking your Avocado Cilantro Mousse has my name written on it, perhaps for Easter. Whaddya think? WONDERFUL! I just added a link to your site on my SRC post of today…. you made my day! yes, the avocado cilantro mousse is perfect for Easter….. I hope you do try it! special thanks sally , It looks great , I would love to try this recipe. Definitely going to try this. A MUST will be a huge dollop of whipped cream on top as hubby loves whipped cream. YUM! I cooked mine in a bundt tin as I don’t have a spring pan and reduced the New Orleans rum to 2Tbsp and it is fabulous. AWESOME! Thanks so much for the feedback, I love it when a recipe from my blog works well for my readers! I love recipes that work every time! Must try this! I used Bacardi rum and it worked great. My only negative comment is this cake needs to be eaten fresh. It’s not real great after a couple of days. I believe you… I must say the cake was inhaled within hours, so we never had to test its “endurance” after baking. But I am not surprised that it would suffer a little. I just love this recipe. I didn’t have any Apple schnapps so I used peach schnapps instead. It turned out great! This is definitely my/hubbies favourite Apple cake recipe. So glad you enjoyed it! It is a fantastic cake and I keep getting feedback about it, sometimes by email, but of course I much rather have comments here on the blog…. Have a great Sunday! Is it possible to freeze this cake after it’s baked? Or would it goes all soggy when it’s thawed? My name is Shandra Thomas and I have a blog called Shandra Eats. Looking forward to reading your blogs! Made this yesterday and took some to work. It was a big hit. Went really well with some Blue Bell vanilla ice cream. Oh, the vanilla ice cream makes it PERFECT, I am sure…. glad you love it, it is definitely a fantastic cake! Sallybr, I had the distinct pleasure of making and sharing this cake after you featured it in June’s IMK. (Enjoy the hiatus until September — and keep baking cakes!) Everybody LOVED it! Thanks, xo. P.S. Coongrats on your 7 year blog birthday — your Red Velvet cake looks fanstastic, too! Wonderful! So nice that you loved it to! thanks for the 7 year wishes… time goes by too fast! I tend to be a wimp when it comes to changing cake recipes because…. I AM a cake-o-phobe of sorts… but you definitely seem like a brave baker, so maybe you should give it a try? If you do, please let me know…. Hi there and thanks for your quick reply! I’ve been looking at conversion sites too, but they are all a bit different! I was recommended a good one and a stick of butter is 110g!! I know it’s only slightly different to yours (114g), but if each ingredient is slightly out the cake won’t work! I did try this cake but it seemed an awful lot of sugar (150g) to flour (90g) – with the conversion table. It really needs the recipe to be tried and measuring the ingredients in metric along the way! Impossible for 7 years of recipes, but maybe for the new ones. We Europeans find it so frustrating when we see so many wonderful recipes on US websites …. and then our hearts sink when we see the words “cup” or “stick”!!! Anyway, the cake was quite nice so I might keep “tweaking” the recipe until it comes out right. Thanks for the conversion table – I WILL keep trying your recipes! plus, it gave me the opportunity to bring the cake to the department and everyone is happy…. (I do think measuring the baking powder with the teaspoon is easier, depending on the type of scale you have). Hi and thank you so much!! I have tried the cake and it’s wonderful!! BTW, we use spoon measures in Europe, too, it’s only sticks and cups we have trouble with – I once remember trying to squash a load of soft butter into a cup and thinking “there must be an easier way to do this”!!! Thanks again for your time and help – this cake could become a regular favourite! Hi there, has anyone tried doubling the ingredients to make a bigger cake? With some recipes it works and others (for some unknown reason!) it doesn’t. I think this one could work, though, so I’m going to try it. Any suggestions? I think it could work but maybe better then doing it in a 9 x 13 in baking dish, maybe? Worth a try! way too dry. too thick a batter and too many apples. didnt rise . definitely needed more flavor . very bland. i like moist cakes and this want it. I made this for Easter dessert today. A big hit and other than peeling & coring the apples, the easiest cake I’ve made. Looking forward to trying other recipes from the cookbook author. I very much appreciate and enjoy your cookbook reviews as I would not have known about this recipe, or Dorie, or other authors. I enjoy reading cookbooks and watching cooking shows but I’m much more motivated to cook a recipe from a cookbook when a home cook has tried it and reviewed it first. Thanks so much for taking the time to come back and give me feedback! It is one of our favorite cakes… never had a problem with it, and everyone loves it! I love this recipe. I’ve made it at least three times since Christmas, maybe more, and I’ve been experimenting with different alcohols. So far, I’ve tried apple Crown Royal, apple Jack Daniels and most recently some cheaper, knock off version of the Crown Royal that the guy at the liquor store suggested. It was okay, but I think the Crown has been the best. I’d like to try it with schnapps, though. So simple and easy!! This recipe is incredible! I just love it so now it has become a really easy tasty cake that I make all the time! Our family favourite for sure! Thankyou so much for sharing. Isn’t it a fantastic, simple, straightforward, amazing recipe??? Just stuck mine in the oven! My son had apple bourbon whiskey that he wanted me to try baking something with-the batter tasted delicious-I did add cinnamon to the flour. Even bought a new cake stand to photograph it! WOW!!!! That sounds so cool! I hope you love this cake, it is really wonderful! Sally, o seu bolo está lindíssimo! E super delicioso, sem dúvida! Até parece que sinto o aroma dele por aqui)). Ficou tão apetitoso)) Adorei!